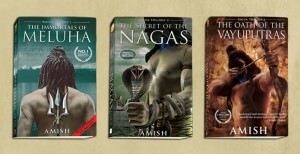 Shiva Trilogy (Amish Tripathi) by Milliblog! I finally completed Amish Tripathi’s Shiva Trilogy today. I read the 3 books back-to-back (I’m late, I know!) after the release of the last of the trilogy, The Oath of the Vayuputras. This was my first all-eBook read for a trilogy (first two – The Immortals of Meluha and The Secret of the Nagas from Flyte eBooks and 3rd – The Oath of the Vayuputras, from Google Play). For those asking – no, I don’t use a dedicated eBook reader. My Samsung Galaxy S2 more than works as a competent eBook reader – it is with/on me all the time, almost any time of the day and I read whenever I get small amounts of time, again, all through the day. I convert most of the times I am waiting for something/someone into reading time (besides Twitter checking time, that is!) since my eBook reader is always with me. I loved the plot and theme – interesting reinterpretation of a familiar myth that stays largely true to individual characters, their motivations and their story arcs, but for minor aberrations. Like Maharishi Brighu, for instance, who was involved in Sati’s death, after she commits suicide – Sati is supposed to have committed suicide in the peace treaty meeting (which had a different context in the actual Daksha myth), unlike the book where she fought and died. According to the actual legend, Brighu’s demons were instrumental in killing Shiva’s guards when they hear news of Sati’s suicide and run amok in the meeting. But, besides such occasional literary freedom, in most situations and characters, Amish seems to have researched adequately to stay true to a large part of their arcs. The writing style, to put it mildly, was pedestrian, but I suppose this is completely intended to ensure that it reaches a large mass that started reading after Chetan Bhagat tore open the market and exposed publishers to a new, large audience base. I was more interested in identifying characters and how Amish played them out in his own way. I have been fortunate enough to learn the actual myth from my from family (my grandmother and mother) and was fully absorbed in matching actual versus Amish’s interpretation. From that perspective, Amish does a fantastic job. His attention to detail is particularly very impressive. He has broken down many complex concepts and theories that have been shared purely as myths with limited meaning (sacrificing the deeper significance at least in popular versions of these myths) and has expounded them in a very believable, real world context. A minor concern is about how the younger generation that is exposed to the actual characters from this myth only through Amish’s trilogy, for the first time… and how they may react if they – if at all – come to hear the original myth. I understand that even the so-called original myth is nothing but stories that have been passed through generations, but still, they did exist long before Amish’s reinterpretation. For instance, how would you react if I told you that, in Ramayana, Sita was Raavana’s daughter? Hold on to your outrage – this would be absurd to you, but if you look at the Thai version of Ramayana – Ramakian – it has the back-story of how Sita was born to Raavana and when his brother predicted that the girl would bring ruin to his kingdom, they had placed Sita in a bowl and left it in a river (much like Karna’s story in Mahabharatha). That bowl, according to Ramakian, was found by King Janaka of Mithila who was a hermit at that time, taking a break from his royal duties. Now, please don’t ask me if Raavana abducted and wanted to marry his own daughter if we go by this back-story – that’s something you need to ask your Thai friends. The point is, we grow up with a version of the myth. When confronted with an altered version, things get confusing. But, when the alternate variants of the myth are equally old, and have a solid following (at least in other parts of there world), it perhaps makes sense on why they exist (passed on from generation to generation, I’m sure there would be errors, additions and omissions for such large and wide myths). Amish’s alternate version is a commercial, fictionalised version. A large set of younger generation may assume this to be the real myth when they come across names from the trilogy in the actual myths – like say, Bhagirath, whose Bhagiratha Prayathanam was a severe penance to bring river Ganga down to Earth. When they come across the real myth’s Bhagirath, I’m sure it’d lead to confusion in their mind since 90% of Bhagirath’s character arc (his character, his parents etc.) has been used as-is by Amish. But the other 10% is either left unsaid or added with a reinterpreted twist. I’m not sure if that is a valid enough concern, but it was precisely this ‘match the characters and places’ pursuit that had me really interested in the trilogy, despite the atrociously poor writing style (In one instance, Veerbhadra tells Shiva and Sati, ‘Get a room, guys!’). There’s a lot to learn and enjoy from this trilogy, particularly if you are privy to the actual myths Amish has referenced generously in the books.